Linda Ang and Robert Stooley ..... Contrary to expectations, Robert & Linda did not meet through music, but via a dating website. 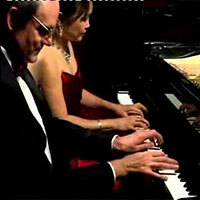 They married in 2008, and created "Piano A Deux" in 2010. Since then, they have wowed audiences in Hungary, Italy and Germany with their spicy programme titles, comedy and virtuosity, demonstrated through original musical arrangements. They have also played extensively in London, Oxford and at venues like Hever Castle in Kent. Their work on luxury cruise liners has turned them into globetrotters. Their repertoire includes the standard piano duo works, but they have also delved deep into dusty library drawers and now champion several neglected composers. Their claim to fame was in 2012 when "Piano A Deux" were on ITV's 'Britain's Got Talent', where one of the judges Amanda Holden said, "I'm sure that the Royal Family would love this!" Through sales of their first CD: "Strictly Not Bach", released in 2011, they have raised £2,000 for World Vision and other charities. A second CD is planned for summer 2015. ROBERT STOODLEY Robert who studied the piano with Dorothea Law, (student of Paul Baumgartner and Alfred Brendel) is also a linguist and published songwriter. Apart from his studies in Latin, French, Italian, Spanish & German, he was given the choice of studying Hindi or Chinese. Robert chose Hindi not knowing that he would one day marry a Mandarin speaker. LINDA ANG STOODLEY Singapore born pianist Linda, is a prizewinner with awards like the Royal-Overseas League Accompanist*#39;s Prize. She was also harpsichordist of the Guildhall String Ensemble when they won the Internationales Jeunesses Musicales Competition (Belgrade). Linda has performed in the UK, Europe, Mauritius and Singapore; on Dutch and Mauritius television, Radio Scotland, Radio Oxford, Radio 3, live on Classic FM and Premier Radio. She has recorded with several artistes and has released seven CDs of her own. She was featured in Singapor's "Straits Times" and Singapore Airlines In-flight Magazine and was cover girl for "Woman Alive" magazine.